The perfect setting for wine with friends on a balmy summer’s evening, Michael Beanland’s home, nestled in the idyllic Suffolk countryside, is a relaxing retreat filled with collectibles and fabulous light. Looking for more ideas and inspiration? browse more of our real home transformations. For more advice, check out our renovating a house guide. Layout: A two-storey rear extension has reconfigured the property, adding an open-plan kitchen, and above this a bathroom and bedroom, created partly by converting loft storage. 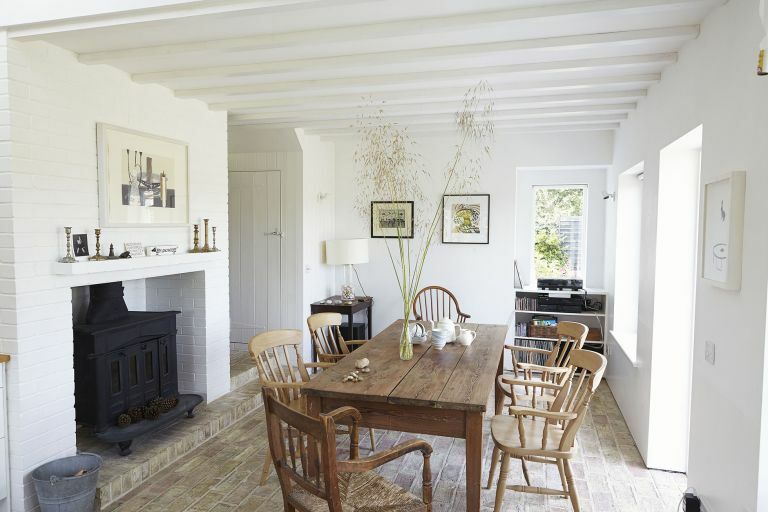 'Being honest, I shouldn’t really have bought this house,’ admits Michael Beanland of the beautiful cottage, sandwiched between the rivers Alde and Deben on the Suffolk coastline, that he has called home for the past eight years. Taking in the expanse of open countryside and golden light that bathes the characterful cottage, it’s hard to imagine why anyone would hesitate to buy it. But, as Michael explains, it has been a labour of love ever since. Michael’s extension has made a vast difference to how the space works; there were originally just four rooms downstairs spanning off one corridor, and one large room upstairs that needed subdividing to create an ante room to give access to the bathroom from the new bedroom over the kitchen. Rooflights now make the most of the gentle Suffolk light, and white-painted timber weatherboarding on the new extension helps it to blend in with the older part of the cottage. The old kitchen is now a bright, welcoming hallway, and only the living room remains as it was. ‘There’s not much left that’s original,’ he adds. a smallholding for a nearby agricultural colony, and which later housed Home Office prison wardens. Although, he adds, fashion designer Margaret Howell also has a place nearby. ‘It’s on the Sandlings peninsula, right on the edge of Suffolk and quite cut off. It’s mostly agricultural, but it’s a great place to get away from the city.’ Michael gets away as often as he can, travelling two hours from London a couple of times a week. With the building work completed to his plans by local builder Ian Coote, he could start to think about interiors. The cottage’s calm, comfortable feel is at the heart of what makes it a perfect retreat from the bustle of London, so Michael chose a relaxed style of décor, with furniture and accessories sourced from antique shops in East Anglia and Yorkshire (where Michael is from originally), as well as from holidays in Wales. Michael bought the Regency wood-burning stove, designed by Benjamin Franklin in the 18th century, from The Fireplace in Framlingham. 'My inspiration for the house is Kettle’s Yard in Cambridge, crossed with the Bloomsbury Group,’ he explains. ‘Nothing cost very much; I’ve just collected things I like over the years. The most expensive piece is probably the little round Georgian side table in the living room. Otherwise, the kitchen table cost just £200, and had splashes of paint all over it. The Danish chair in the kitchen cost about the same, while the railway poster in the living room came from a junk shop in Wales. As for the structure and fabric of the house, a local carpenter took care of much of the work that Michael couldn’t manage himself. ‘I really care about the details, so I knew that’s where I would spend the budget. For example, all the windows needed replacing, and the kitchen floor is made from reclaimed Cambridge brick that came from buildings on the Duke of Bedford’s estate. But I built the bookshelves in the living room, and painted the entire house myself. With such a beautiful setting, and stunning open views, the outside space was as important to Michael as the house. Despite, or maybe because of, the challenges of the environment, and the time and effort he put into renovating the house, Michael couldn’t be happier with the end result. ‘When I visited the house for the first time one February morning, I knew it would repay every effort.